My living room holds a rather ordinary looking 75 gallon aquarium filled with simple aquarium plants like chain swords, willow moss and a stand of Staurogyne sp. Bihar. I don’t put a whole lot of effort into the aquarium other than a monthly water change and to trim the plants when needed. The author’s living room rainbowfish aquarium. Rainbowfishes of three species swim about in lazy grace while Corydoras sterbai and Otocinclus catfish root through the substrate. However, our ordinary rainbowfish aquarium shares with us moments of the extraordinary, especially after the monthly water change. After a water change, one of our rainbowfish species, a rather rare one in the hobby, Chilatherina alleni “Wapoga” will go through a remarkable transformation. Chilatherina alleni “Wapoga” cruising lazily in the aquarium beneath the Staurogyne sp. Bihar. The colors of the males will intensify in wild pastels of blue, yellow, orange and every shade in between. The males race about the tank flaring up to one another and blazing transient flashes of white on their foreheads and napes. Two males size each other up for a fight. They are most aggressive after a water change and I have found to keep them from damaging each other too badly, I limit the water changes to once per month. In a frenzied dance, the dominant male will try to attract the female C. alleni over to the largest willow moss clump in an attempt to get her to shed some eggs. The whole effect is quite frenetic and a contrast to the normal placid state of the aquarium. Right after a water change, two male Chilatherina alleni “Wapoga” wrestle for dominance. By the day after the water change, some of the males will have torn fins and they colors will have turned again to their subdued normal state. The dominant males will likely still be active over their moss bowers, courting the females with their blazing foreheads and dance. Chilatherina alleni “Wapoga” males circle each other. Though most of the combat is ritualistic in nature, fins do get torn and the fish exert a lot of energy. They fly through the aquarium at top speed all morning. It’s then that I have to stand back in admiration of these fish and recall the story of how these Chilatherina alleni “Wapoga” came to be in my living room. My Chilatherina alleni “Wapoga” were F1 offspring of wild fish collected by Gary Lange and introduced to the American aquarium hobby just in the last few years and are still quite rare. I asked Gary to share with me, his own journey and history with this beautiful fish. An excited Chilatherina alleni male is a sight to behold. A transient flash of white appears over the nape of the fish at the height of his courtship display. It’s really hard to photograph the blaze but this photo gives you an idea of it. 1) Gary, I suspect that you’ve been fascinated by the Wapoga variant of Chilatherina alleni for many years now, can you tell me a bit about your history with this fish? The Aqualog book “All Rainbowfish and related families” was printed in 2002, before we had any C. alleni in the hobby. There was a bright yellow specimen right on the front cover from Siewa. Many “bowheads” lusted in their hearts for that fish, along with the “striped praecox” from the same area. I especially wanted it because in a roundabout way I helped name it. The discoverer, David Price and I became pen pals for a while when he was trying to get hold of Dr. Gerry Allen as he had some new rainbowfish for him to see. I suggested to him that if he ever found another new rainbowfish to find another ichthyologist instead to help him write it up and then name it for Dr. Allen. It seemed so crazy that there wasn’t a rainbowfish named for one of the most famous modern ichthyologist and the most famous “rainbowfish hunter”. Obviously, if Dr. Allen wrote the paper then he couldn’t name it for himself, that’s just not done. So when David found a new fish from the Siriwo region he named it for Gerry in 1996. It was a fish though that was quite blue with some yellow stripes in it. Not too many years after that Dr. Allen went to the airfield in Siewa and collected some specimens, took some photos of the live fish and then put them all in alcohol, none came back alive. In 2008 we brought back the mostly blue C. alleni from Siriwo. We didn’t visit the region then but got it as a gift. Although it is a very beautiful and energetic rainbowfish it still wasn’t the bright yellow one from Siewa. In 2012 Johannes came up with the plan to visit the region. The airfield that Gerry had easily landed in years before to collect four species of rainbowfish in short order was no longer there. We would have to go the “crazy way”. Over the sea and then up the Wapoga. 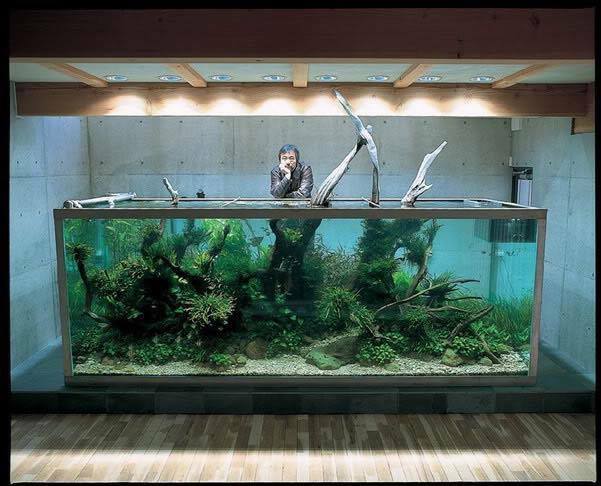 But take a good look at a picture of that fish or better watch an adult live specimen swimming in a nice planted tank. It’s really awesome, so call me crazy but it was worth the hurt and the difficulty getting there. 2) What was it like to catch your first Wapoga alleni? Can you describe the experience for us? We had originally thought we would have to walk several miles to reach the original airfield to find this rainbowfish and the others we were seeking. After a half hour or so of walking it was pretty obvious to everyone that we weren’t going to be able to walk that far through the forest, the old logging road was really nowhere to be found. Actually we found it but the brush was worse on the road than it was just slogging thru the jungle! Oh, did I tell you that it was raining pretty much the whole time? It’s never 78 degrees and sunny. It’s either oppressively hot and sunny or rainy and hot. The creeks had a lot of tannin in them and muddy banks were so much fun to navigate. All of those plants with spines that were on the land were often in the water too. They were very muddy and I can’t tell you which was worse holding the seine and kind of sinking in the red/brown mud or trying to run toward the seine and “herd” fish into it. You were always mindful of losing your water shoes to the mud and having to walk barefoot instead. We started catching the “long-nosed” Melanotaenia rubripinnis first and then shortly afterwards pulled up our first bright yellow Chilatherina alleni. It was pretty exciting and made the difficult fishing and the rain worth it. Most importantly though, we were also catching fish that were small enough to be able to transport them back in bags. You really don’t want to be carrying large adults around with you as they are quite difficult to get out alive. 3) Do you plan on going back to collect this fish? The only reason to go back to that area would be to collect Melanotaenia rubripinnis and Glossolepis leggetti. 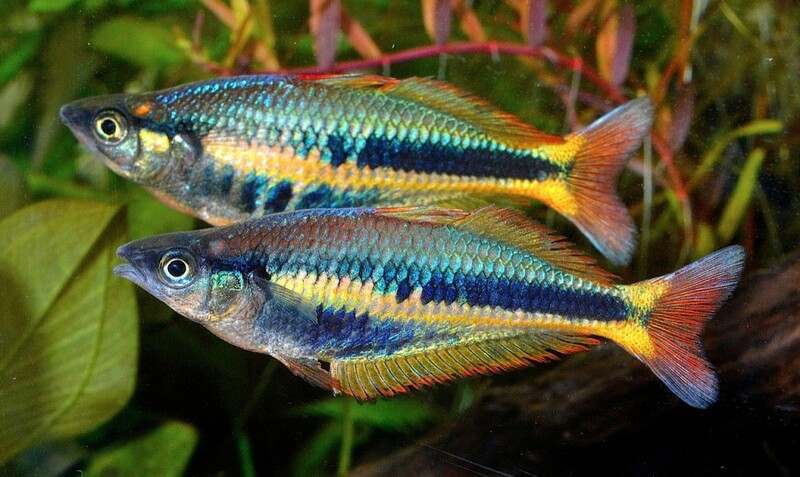 I would really like to see what a full-sized, unstressed leggetti adult rainbowfish really looks like. 4) Is there any hope for commercial imports of wild New Guinea rainbow fishes like the Wapoga alleni to enter the ornamental aquarium trade? It’s just too hard to get large quantities of small fish out as a commercial business I think. Rainbowfish are pretty fragile and it takes a very long time to get them to a big airport. This was tried many years ago with Melanotaenia boesemani where they made the mistake of trying to put large quantities of adult fishes in boxes and ship them. 5) Have fish farms requested fish from you for their commercial propagation? In general, I have been quite disappointed for the last 25 years in the commercial propagation of rainbowfish. Too many crosses and not enough attention paid either to nutrition or selecting quality breeders. I have in the recent past found a really smart and savvy farm that knows how to breed bows and it really seems like they are keeping them pure. Hopefully, sometime next year I’ll be able to start sending them rainbowfish and perhaps eventually alleni from Wapoga to get them widespread in the hobby. 6) Any other remarks you would like to make about this fish, its biotope, breeding it or interesting anecdotes relating to its collection? 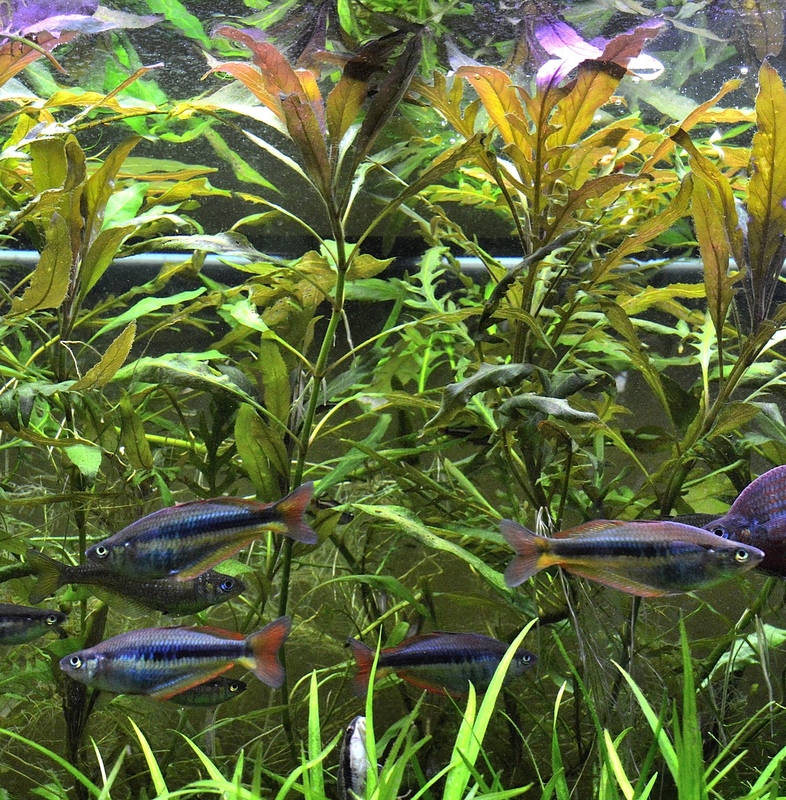 Like all rainbowfish, put it in a planted tank, they really shine there. This ‘bow can make some of the other rainbowfish seem quite slow. That is to say this is a really fast moving rainbowfish that never seems to quit. They are a real challenge to photograph and a whole lot of fun to watch. All photos by Steve Waldron. See more of these amazing new and rare rainbowfish discovered by Gary and others in the November/December 2014 issue of Amazonas magazine. A male Chilatherina alleni “Wapoga”, showing his normal coloration. Flash photography really accentuates the blue color. Thank you Heiko! I appreciate the kind words, coming from you this means a lot. If you are ever in Seattle, I would love to have you visit our shop, we are working hard to honor the aquarium hobby that you and all the pioneers of this great hobby have gifted to us. I look forward to getting a copy of your new book! Lynn Sumerson- I know things like paraguard, and carbon boosters similar to flourish excel can kill snails and shrimp, so you could try something like that, be careful not to hurt your plants tho. Just curious why don’t you want snails? I’m always happy to get self-reproducing hitchikers for free that clean algae. I would like to know what breeder that is. I think Wapoga is a misnomer. 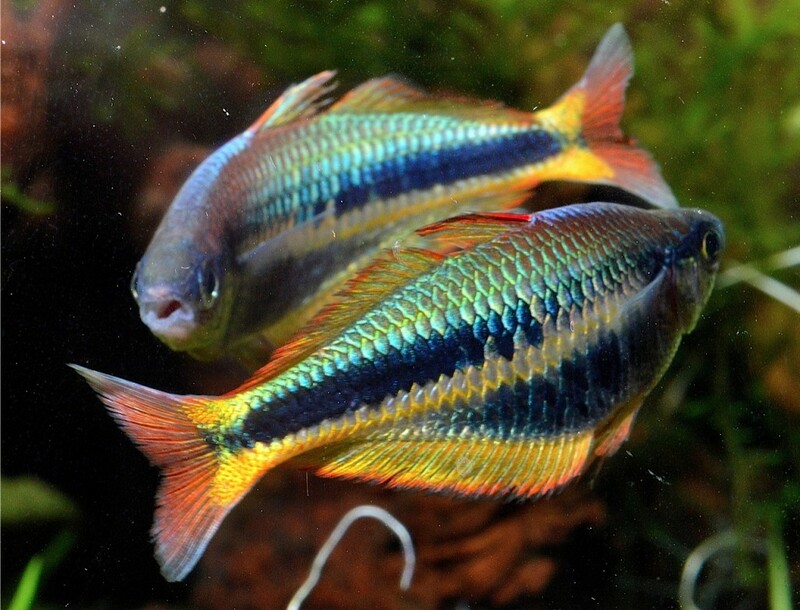 Chilatherina alleni is called Allen’s Rainbowfish. Melanotaenia rubrivittata is the actual Laser Red Wapoga Fish. Lynn Sumerson- I know things like paraguard, and carbon boosters similar to flourish excel can kill snails and shrimp, so you could try something like that, be careful not to hurt your plants tho. Just curious why don't you want snails? I'm always happy to get self-reproducing hitchikers for free that clean algae. I think Wapoga is a misnomer. 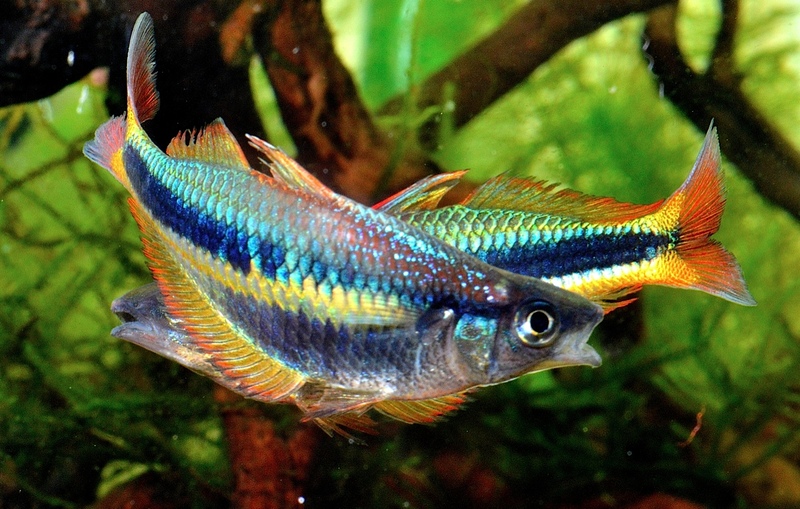 Chilatherina alleni is called Allen's Rainbowfish. Melanotaenia rubrivittata is the actual Laser Red Wapoga Fish. I wanted to ask what he breeder is that he trust. Quote: "I have in the recent past found a really smart and savvy farm that knows how to breed bows and it really seems like they are keeping them pure." I would like to know what breeder that is.